Admit it, you've all looked at your own dogs and thought 'isn't my dog the best'. It's human nature, we all think our dogs are awesome and have that special something that makes them a star. And it's true, they all do. Dogs are universal and so it's not surprising that more agencies and brands are taking notice of our special dogs to help them promote their products in the media. But as well as dogs who use their talents to promote brands, there's also a new breed of dog models taking over social media with paid for tweets and Instagram posts, says Kim O'Meara. Here are 5 dogs taking the advertising world by storm you've probably seen, admired and said 'aww' to without knowing their story. 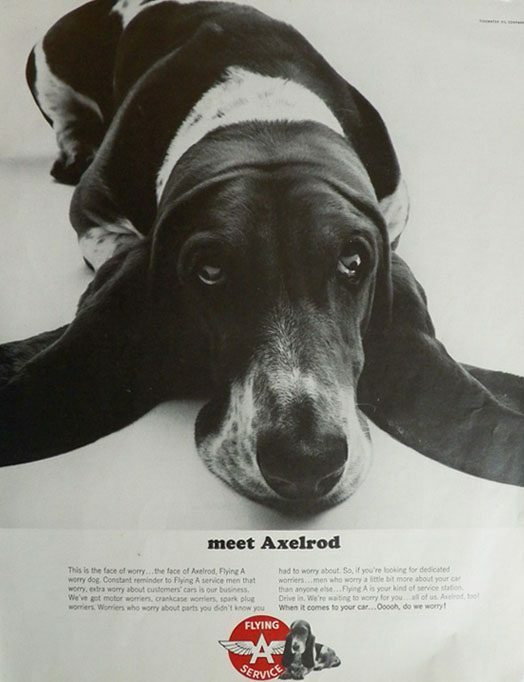 An old school advertising dog, Axelrod was the Basset Hound who featured in the US print adverts and TV commercials for the Flying A service station company in the 1960s highlighting that this lovable hound lived in the 'house that worry built'. However when the company was sold in 1966, Axeldog retired but not before there was a line of products to capitalise on this lovable long-eared dog's popularity. He was most likely a pioneer of the field and one dogs today can follow the path he forged. Knox is a mini long-haired Dachshund from Raleigh in North Carolina who has built a fan following on Instagram of almost 65,000 dog lovers who regularly tune in to see where he's been and who he's been with. A social media following for dogs who's owners showcase their personality with fun moments and captions capturing their daily events is big business. According to the Wall Street Journal, dogs with followers of 150,000+ can charge around $200 USD with certain dog agents claiming their clients make more than $20,000 USD! Smurf is a 6 year old Parson Russell Terrier who has been appearing in advertising campaigns for the past 6 years. Most recently his skills saw him shine on a TV advert for Samsung, but he has worked with multiple pet food companies previously and counts skateboarding, surfing and litter collecting as three past times he enjoys! With a real aptitude for learning, his owner Sarah Humphreys told K9 Magazine: “Smurf is the first dog I've learnt to do tricks with. I brought him home at 14 weeks old from a breeder in Dorset and everything he's learnt, we've learnt together. Smurf's ability to learn a storyboard/script in one short training session is what I think makes him stand out. To reinforce this, Sarah shared a home video of Smurf training. “In these videos, we hadn't pre-rehearsed anything. It was just an idea that popped into my head and because he was I think doing so well - I just grabbed the camera and started filming him. There are not many dogs you can ask to 'stay' whilst you balanced a card board box on his head (having to lower the head to reach box and keep it steady), then left him standing still with a lowered head, whilst you walked back to the camera ready to film - and when you said 'go' he would only at that point gently bash the lid to fall on the floor.....all completely unrehearsed dog word games. What makes Smurf so special? Sarah puts it down to his ability to understand what she's asking him to do. Jiff is a Pomeranian who makes up for his small stature with a big personality. I mean, he's got 2.4m Instagram followers and we have all seen the generation of Jiff-wannabe's copying his hairstyle. I can only imagine how many Poms are going to their grooming salons and asking for a 'Jiff the Pom' on top. Jiff's social media account, like Knox's, details his daily adventures and behind the scenes of his latest advert campaigns, like this below which was a behind the scenes shot from his latest photoshoot at #playlistlive. Sykes is a Parson Russell Terrier cross breed who was found abandoned in 2004 aged around seven months old. After being found by dog walkers who were out walking their own dogs, Sykes found his home with dog trainer Gill Raddings, who regularly trains and provides dogs for TV work (she is the owner of Wellard on the British soap, 'Eastenders'). Skyes is possibly best known for his work as Harvey on the Think Box TV advert which was designed to show the effectiveness of TV advertising, aired during a period of decline in the industry. Since then, he has gone on to star in various films and other commercials, including a starring role alongside British comedian Peter Kay for John Smith's 'dog show' commercial. Owner of his own Wikipedia page, he also has a regular role appearing in the ITV show 'Midsomer Murders'. We hope you've enjoyed reading about just 5 of the special dogs who've enhanced our advertising experiences, made them memorable and made us laugh over the years. If you have a favourite, comment below and share yours with us - we love hearing from you!